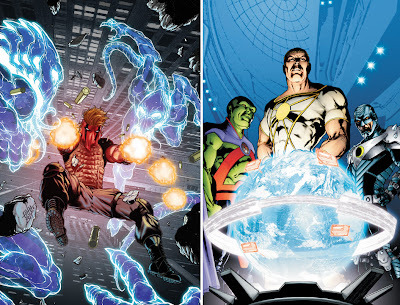 Suddenly I'm thankful some of my staple DC favourites like The Spectre and Adam Strange didn't get spots in DC's 52 comic relaunch. My initial want list had 21 titles! Thankfully by adopting a Russian roulette type attitude, I've picked these ten to fill my vacant DC pull-list spots, plus two back-ups, should any of the chosen sink rather than swim. The Under 52 Word Motive: When Wildstorm was up and running it hogged my pull-list, now these two look set to do the same. Grifter is the staple of my new 'DC ten', and I can't wait to see the League find out about Martian Manhunter's new powerhouse friends! Maybe he can bring Zauriel with him? 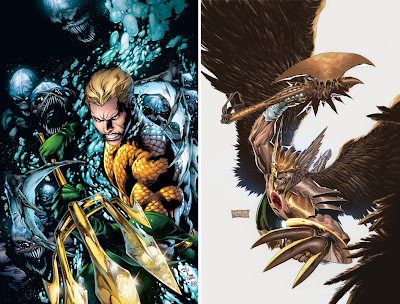 The Under 52 Word Motive: Due to their mythological ties, Aquaman and Hawkman hooked me as a kid. Making them easy picks here, hopefully Aquaman brings some new undersea locations where the door isn't always at ground level, and Hawkman, an allayed fear of the word 'savage' in the title! 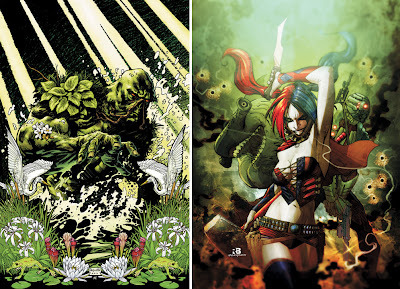 SWAMP THING and SUICIDE SQUAD - Go The 80's! The Under 52 Word Motive: Both icons of great 80's DC, having American Vampire writer Scott Snyder helm Swamp Thing is four colour genius (or three if you buy online)! In contrast, it's the mix of modern characters with the concept of Suicide Squad that has me - just don't forget The Wall or Bronze Tiger! The Under 52 Word Motive: I'm a nut for the Legion. While Paul Levitz's current series doesn't need a relaunch, hopefully this will net a few newbies. 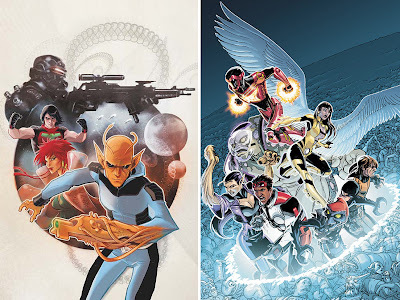 With Fabian Nicieza (New Warriors) writing those lost back in time, I'm sure that book won't loose the futuristic sci-fi, that makes the Legion one of the genre's best concepts. 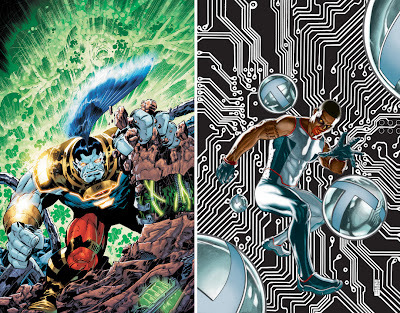 If I had more experience with his creative team, Mister Terrific would be a dead-set. It's great seeing him land his own book! Forget Keith Giffen or my 'anything Kirby' addiction, the persective of a guy transformed into a killing machine against his will has me hooked on giving OMAC a go. What titles are you looking to grab? On suicide squad, I'm interested for now, of course, but some years ago there was this version of 12 issues, with new characters, that was... meh. And I had put my hope´s in it and pre-ordered them, so I wouldn't risk missing any issue. No Boomerang and Waller just showed up at the end. The stories were really nothing special, to me. No offense to whomever liked them. I hope it will be better now, and that there will be a balllance between old and new SS. For me the other titles I'm interested, are Deathstroke,all the bat-family, and green lantern family. I will peak the others and see if I like them. Won't be the first time I get hooked on a story, because of that issue in which something happened. Wasn't grifter in some team with the Juggernaut, quite some years ago? I think you hit the nail on the head for some of the titles that are constantly revamped Aliera - people have brought into relaunches in the past that didn't have as much effort put into them as others and now they are a little jaded as to why they should go back. I'm sure the 52 relaunch is going to show that where people opt for titles they know DC is throwing everything into, like David Finch on The Dark Knight. I recently gave up the GL titles, which is lucky as I couldn't fit the whole family of them anymore. Looks like there is going to be some exciting stuff there though! 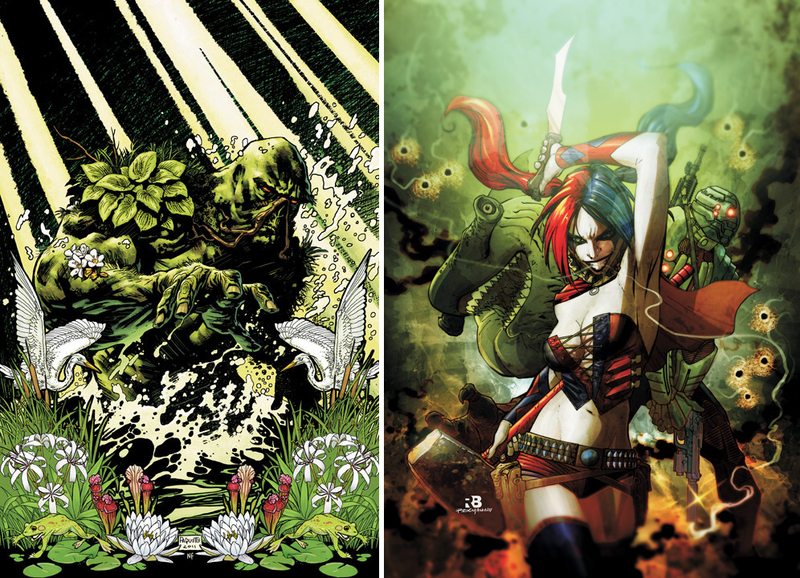 i like how you put Swamp Thing and the Suicide Squad together in that line up. those are two of my favorite titles of the 80s. and damn straight about Waller and Bronze Tiger! but what the #$%& is up with King Shark!? since when were his eyes on stalks? he's scarier when he looks like a great white rather then a hammer head. I seriously want to read Grifter...he was always one of my favorites. 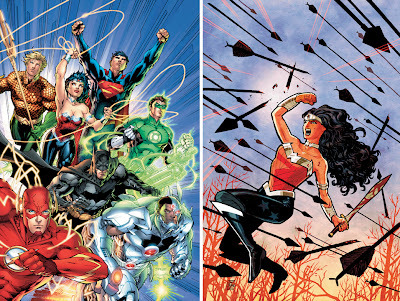 I just found out, unfortunately, that the person I bum comics off of is not going to be buying Justice League anymore. So I'm gonna have to figure that out. Because I can't quit it yet. 'Specially with Cyborg in there. I'm with you about Legion, which I think will suffer the least with a reboot, because, hey. The fans are used to it. I think we'd probably have a heart attack if they didn't reboot once in a while now. Glad you are jumping in on Grifter Random, I'm thinking that is going to be one sweet book! You're so right about the Legion too, if only a run got to the same digits as their roster we'd be fine. This JLA will be the first time in years I've picked the League up, as I dropped it not long into Robinson's run. 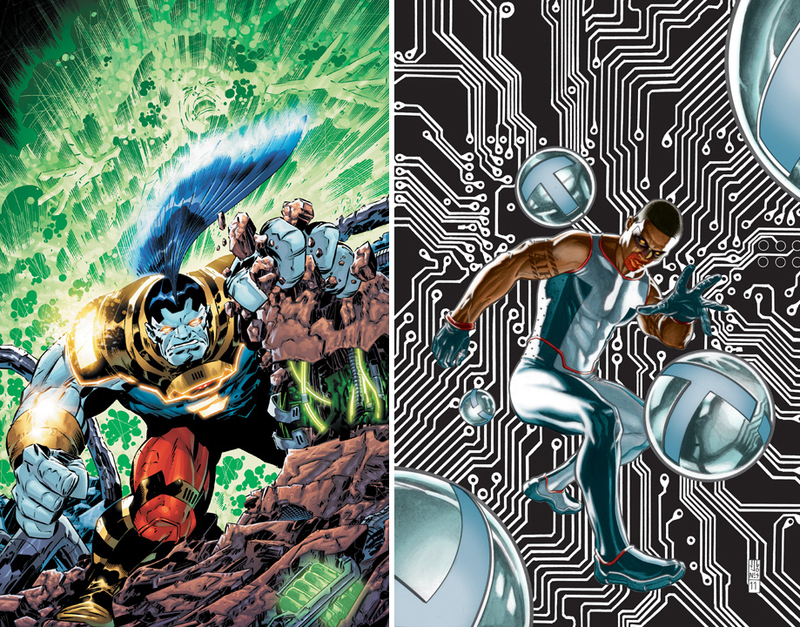 Cyborg is my big incentive too - it's about time he made the grade.... oh yeah and some dude named Jim Lee.